Love the lace tablecloth...so pretty!! We had a craft supply store that used to do a sale where you could fill a bag for $5.00 and boy did I ever stuff that plastic bag full!! I love what you have done. Now I need to find me some lace and a wooden ironing board. Hi, I just found your blog and I am so excited. I get that way when I come across another thrift store junky, like myself. I love items that have a bit of history (even if I don't know it . . . I can imagine). I collect mixing bowls and I love thinking about all the other ladies that have used them and the many loafs of bread that rose in them. I am so thrilled for you, that you are buying a home. My husband and I purchased ours twenty-nine years ago and four years ago celebrated having it paid off. Retirement will be so much easier having a clear deed to our home :). There is such a warm and wonderful journey ahead of you as you turn your home into your perfect nest . . . one garbage sell at a time. I am your newest follower and I would love to invite you over to visit and hopefully to follow me back. I love your ironing board vignette - so clever. Beautiful....I would love to have a Walmart bag filled with those goodies! Love the ironing board! Hi! I am right there with you! As much as I love "whiteness", with 4 animals and a hubby that loves earth tones, I think my touches of white will have to do! I create lots of whites, too, so I get my fix that way! Love your tablecloth! It looks fabulous on that vintage ironing board. Your home looks very warm and welcoming! And that watering can of hydrangeas is drool worthy!! 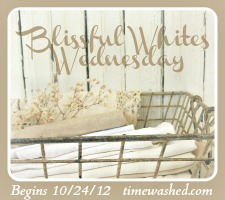 Thanks so much for joining in Blissful Whites Wednesday!